Are you tired of impulse buying? Looking at your wardrobe and saying to yourself "I have nothing to wear!". Do you wonder around shops or websites aimlessly looking for something to jump out at you to buy but you don't know what that is? Have you fallen out of love with your clothes and style? Well now is the BEST time to do a 'back to school sort out'! September is on the horizon and with it comes back to school mentality, a new academic year and a new season of fashion. With the change in season, weather and no summer holidays to look forward to, it can give you a new-year state of mind. So, this new fashion year, in the spirit of new beginnings why don't you take a fresh new approach to your wardrobe and style. So rather than doing the usual supermarket add ins, the sweeps around Zara and Topshop every month and the constant online surfing at John Lewis and Next, take some time to assess what you have already got in your wardrobe. Work out what you can wear this coming season, what you can pack away for later and what you need to buy out of necessity and/or love. The benefits of assesing your wardrobe in this way range from monatary, saving you money on items that you don't need. It also gives you a focus on what to buy, writing a list of what is missing to make your wardrobe work that you constantly adhere to ensures you look at websites / go shopping less. Clearing out clears the mind and gives you a sense of accomplishment and happiness. Also it’s the easiest way to work out what you already have and what gaps there are to fill. How did I feel the last time I wore it? Do I need to be a certain weight to fit into it? Does it look tired or have any wear and tear? Is it the image I really want to portray of myself? What I mean is a 'working wardrobe' for you and your lifestyle. Essentially, it should be 30-40 pieces of clothing that can be mixed and matched to create a feast of outfits that are right for you. Over time you should build a carefully-edited capsule collection of your signature pieces. Easier said than done, we know, but having a good clear out means it’s time to get strict. For starters, the rule of when you last wore something might sound cliché but it works; if you haven’t worn something in the last six months then it’s time to say goodbye. It’s really helpful to create separate piles when deciding what to keep, give to charity, sell or recycle. But while some more expensive pieces might be worth shifting online, selling your duds might not be the best option. Instead, avoid unwanted clothes slowly creeping their way back into your wardrobe and just donate to somewhere they’ll prove more useful or drop at a textile recycling point. Now that you’ve successfully cut down your clothing, it’s important to make sure your wardrobe doesn’t become suffocated by clutter once more. To do this you need to establish a new set of rules for when you go shopping. The start of the New Year is the perfect time to take stock and re-evaluate your personal style. Resolutions don't have to be those dreaded things you make at the beginning of every year, only to be cast aside and forgotten. When it comes to fashion, committing to some new resolutions can help reinvigorate your personal style. Regardless of whether or not you feel like you're in a bit of a fashion rut, or you just want to take your style to the next level, 2018 is the year of making leaps. Read my style resolutions to help your start your new year in style! This means not saving anything for best – life’s too short not to wear that amazing jumper, or go for dinner in that OTT dress. Embracing your special pieces will instantly change the way you see your wardrobe. Let 2018 be the year you don’t buy that dress you’ll never wear just because it’s got a 50% off tag. I recommend adding to your basket online in advance of the sales, so you know you’re purchasing items you actually love. From statement earrings to wow factor shoes, accessories were the star of the show in 2017. The perfect investment for colourphobes and black devotees, try investing in this season’s crop of must haves to easily transform simple looks to stylish outfits. Wearing the right colours that suit your skin tone can change your style, your wardrobe and your life. Knowing your colours improves your confidence when pulling outfits together and when shopping. It also gives you more ideas if you are stuck in a rut wearing black all the time. Break out of your black habit and get your colours done and change your outlook on colour forever. Hands up if you’re guilty of ‘the chair’? Stop throwing everything into a pile this year and, instead, take the time to fold things, hang them up, buy good hangers, head to the dry cleaners – making a little bit of effort will make your wardrobe last. Whilst I love a high street bargin and will always be a Topshop girl at heart, it's always great to try new places to shop. Read my blog on where to find clothes you actually want to wear and get upto date on the new places to shop online. 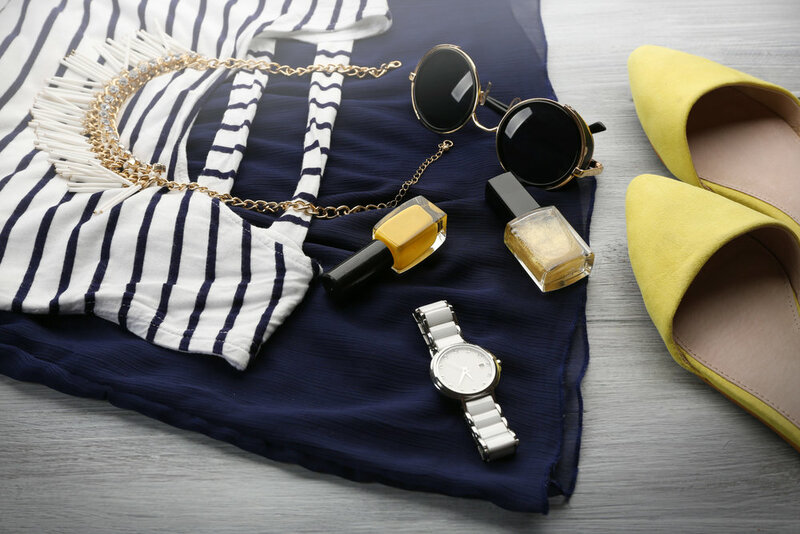 Make the most of your budget by spending more wisely on pieces that have a big impact on your wardrobe rather than buying throw away items in the sale. Avoid impulse buying by delaying your purchase by a day, walk away from the shop, save the link or add it to your wish list and give yourself a chance to really think it through. For more style tips and advice then follow me on social media or book me for a consultation.